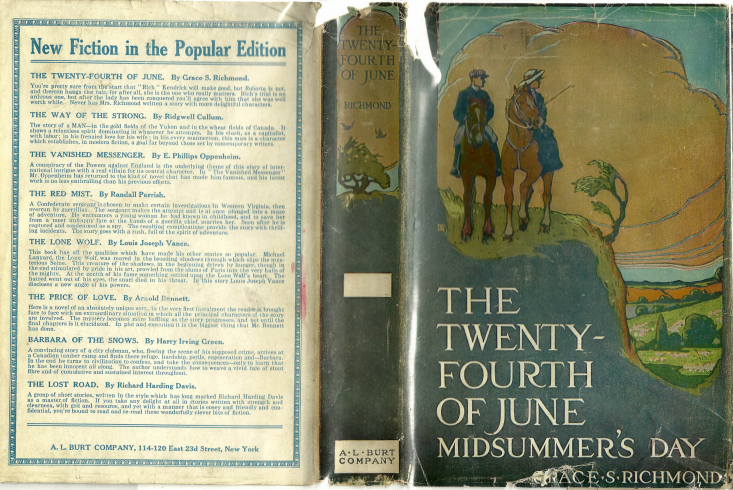 Of all the thousands of books I devoured during my growing-up years, none did I love more than our June selection: Grace Richmond’s The Twenty-Fourth of June, a paean to Midsummer’s Day (the Feast of St. John the Baptist), at the time of the Summer Solstice. It is a love story like no other. The story of a rather arrogant grandson of a millionaire who flits through life with little sense of purpose. Then young Richard Kendrick sees lovely Roberta Gray—and is transfixed. But she is anything but, where he is concerned. For dilettantes she has nothing but scorn. Richmond’s unforgettable novel chronicles the clash that takes place when a man falls in love with a woman as beautiful inside as out—a woman not in the least interested in him. When he persists, she throws down a gage at his feet: if he cares for her at all, he must agree to have nothing to do with her, have no contact with her, send her no gifts—no flowers even—for almost half a year. All the suspense of the novel is woven into the fabric of those months of noncommunication. How it all plays out—well, you’ll have to somewhere, somehow, find a copy of this old book, and read it for yourself. Grace was born on March 3, 1866, in Pawtucket, Rhode Island, to a minister father, the Rev. Dr. Charles E. Smith and mother, Catherine “Kitty” Kimball Smith. Grace was a direct descendant of the state’s founder, Roger Williams. An only child, Grace grew up the focal center of her parents’ manse. In 1885, after having pastored Baptist churches in Mt. Auburn, Ohio; New Haven, Connecticut; and Syracuse, New York, Dr. Smith was called to Fredonia, New York; and there he would remain for the rest of his life. On Oct. 29, 1887, Grace married the personable young family doctor, Dr. Nelson G. Richmond, who purchased a home next door to the manse. So after marriage, Grace merely moved next door. And it was here in Fredonia that the bride would write her many stories, essays, and novels. The home. It all starts there, the action happens there, and it all ends there. Because of this, Grace Richmond is known as The Novelist of the Home.” Of the thousands of writers who have written about the home, only Richmond earned that title. Only in her fictional world is the home the all-in-all, the core, the bedrock. A Court of Inquiry, Red Pepper Burns, Strawberry Acres, The Brown Study, Red Pepper’s Patients, Red and Black, Foursquare, Cherry Square, Lights Up, At the South Gate, the Listening Post, High Fences, and several Christmas novelettes. She was among the most prolific short story writers in America. Most of her novels were serialized as well. For 40 years, she was never out of print. Of the dominant family authors of the first half of the twentieth century, only Zane Grey, Gene Stratton Porter, and Harold Bell Wright were better known than she; and her name ranked up there with Frances Hodgson Burnett, Kate Douglas Wiggin, Lucy Maud Montgomery, Pearl S. Buck, Bess Streeter Aldrich, and Temple Bailey. It was illustrious company indeed. At the height of her popularity she was paid upward of $30,000 for magazine serializations (a princely sum back then!). Doubleday would sell more than 2,500,000 copies of her books. 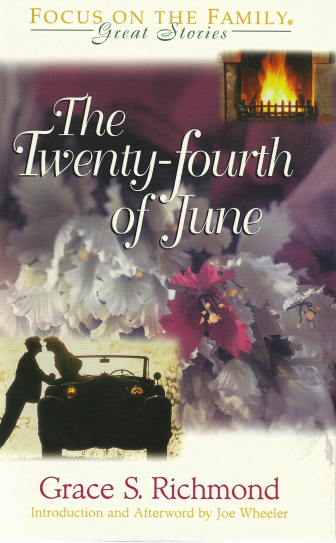 Of the twelve classic books I edited for our Focus on the Family Great Stories Series, one was The Twenty-Fourth of June. It was also the first to sell out; consequently, copies have always been scarce for apparently readers appear unwilling to part with the book. At the front of it is my 55-page biography (which I researched and wrote over a year’s period) and at the back, discussion questions for families, teachers, and home-schoolers. I also include a complete bibliography of all her books and stories. Candidly, I actually feared returning to a book I’d loved so much when I was young. I needn’t have worried: I was gripped with the same fascination as before, even though I knew how it all came out. The title was an inspired choice; there is a symbiotic relationship between the plot and the title—each enhances the other. How many book titles can you think of which are limited to a month and a day? Richmond’s genius is that if you can remember the title, you can remember the plot. But it is more than that, because the date represents far more than the cutting of the proverbial Gordian Knot, the denouement; it is the source of all the suspense. All through the second half of the book, the reader reels back and forth between two questions: Will he make it? And, if he does make it, will it be enough? I know of no other book that incorporates quite the same structure, the same crescendo, of suspense. Copies are available on the web, both the Doubleday edition and the A. L. Burt reprint edition. Since it is the rarest Focus/Tyndale classic book, I can’t help much as I have only four copies left (all new, unread) at $95 (I’ll include postage and insurance in that price; and inscribe them personally if requested to do so). As we begin to pack our suitcases for our auto-trip through our Southwestern national park lodges, I thought this would be the perfect time to see if I couldn’t siphon some money out of your pockets. After all, that’s what’s been happening to me ever since the first time I stumbled on a Williamson book many years ago. 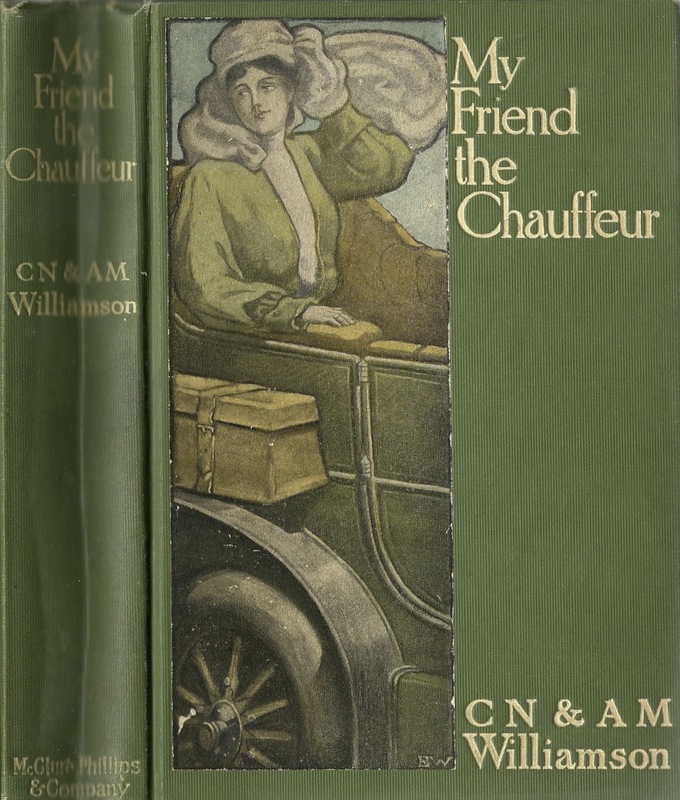 Have you ever wondered what it would have been like to travel when the automobile was new? When there were no transcontinental highways (how about hardly any paved roads at all! ), motels, service stations, AAA, repair garages, etc.? Not to mention automobiles that broke down so often that only the foolish traveled without a chauffeur, mechanic, and ample supply of spare parts and tires. Well, imagine no more. Back in 1902, an adventuresome British husband and wife writing team, C.M. 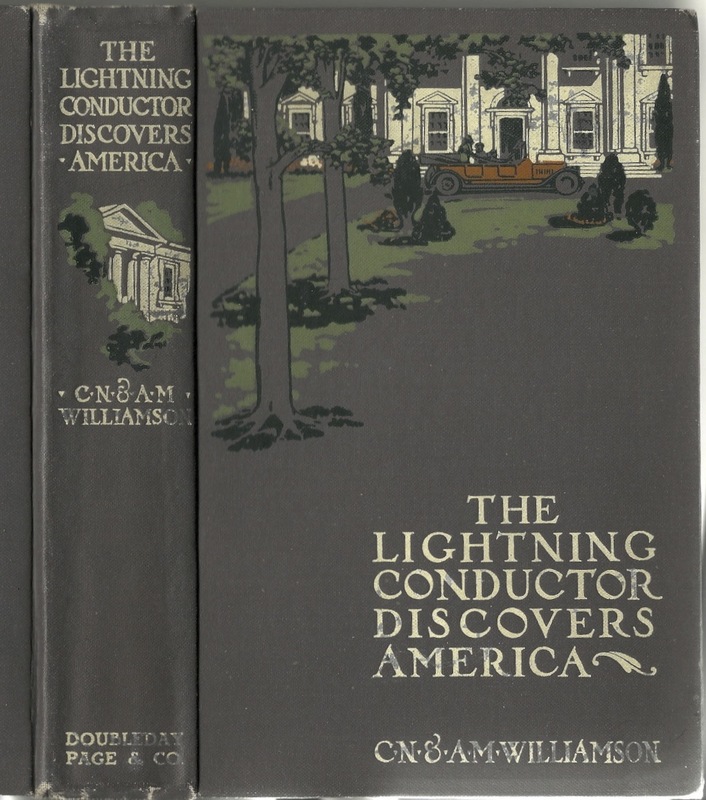 and A.M. Williamson, partnered with Doubleday Page to produce one of the most fascinating and informative series of travel novels ever written. Before they could write such a book, however, the fearless couple had to themselves explore a given travel route. In the process, they devoured local travel lore, legends, history, historical romances—all kinds of fascinating side trips. Then they incorporated all the usual mechanical breakdowns, and stirred in enough romance to keep the reader up half the night turning pages. In short, there has never been another series like theirs! There could not be, for the age vanished almost as quickly as it began. In France: “. . . we moved like a ship under full sail; but suddenly the road reared up on its hind feet and stood almost erect, as though it had been frightened by the huge snow-capped mountains that all at once crowded round us. An icy wind rushed down from the tops of the great white towers, as if with the swooping wings of a giant bird, and it took our car’s breath away” (118-19). In Italy: “It [Certosa of Pavia] was too beautiful to chatter about. But it did seem strange that so pure and lovely a building could have owed its existence to a crime. I had heard Mr. Barrymore telling Mamma that it was originally founded in thirteen hundred and something, by the first Duke of Milan with the view of taking off the attention of Heaven from a murder he had committed—quite in his own family—which got rid of his father-in-law, and all the father-in-law’s sons and daughters at the same time. No wonder it took a whole Certosa to atone for it. . . .”(164). Bellagio, on Lake Como: “The rest of the party were on an entrancing terrace, looking down over other flowery terraces upon the town of Bellagio, with its charming old campanile, and its grey roofs like a flock of doves clustering together on the border of the lake. The water was so clear and still that the big hotels and villas on the opposite shore seemed to have fallen in head down, and each little red-and-white canopied boat waiting for passengers at the quay had its double in the bright blue mirror. Clouds and mountains were all reflected too, and it seemed as if one might take one’s choice between the real world and the dream world” (192). My favorite passage from the book, however, is from Maida (the loveliest passenger in this ancient Panhard automobile) who plaintively poses this rhetorical question: “What becomes of the beautiful army of days marching away from us into the past? The wonderful days, each one differing from all the others: some shining in our memory, in glory of purple and gold, that we saw only as they passed, with the setting of the sun; some smiling back at us, in their pale spring dress of green and rose; some weeping in gray; but all moving at the same pace along the same road? The strange days that have given us everything they had to give, and yet have taken from us little pieces of our souls. Where do the days go? There must be some splendid world where, when they have passed down to the end of the long road, they all live together like queens, waited upon by those black slaves, the nights that have followed them like their shadows, holding up their robes. “I’ve had this thought in my mind often since I have been flashing across Europe in an automobile, grudging each day that slipped away from me and would not stay a moment longer because I loved it. I wish I knew the way to the land where the days that have passed live; for when those that are to come seem cold to me, I would like to go and pay the old ones a visit. How well I would know their faces, and how glad I would be to see them again in their own world!” (205). If you too are getting the Williamson bug, just log on the Internet and begin chasing down these wonderful travel romances. Your travel life will never afterwards be the same! Next Wednesday, we’ll ourselves hit the road. Please come along.